Young musicians need help and guidance to launch their careers and Flutes in Tuscany supports talented young musicians by offering a Young Artist Scholarship – an annual fully funded place for a young artist on the course, along with additional performance opportunities. Katie Sazanova was our first Young Artist in Tuscany. She won the award having submitted a beautiful, live recording on Winter Spirits by Katherine Hoover, where she evoked a rich palate of tonal and colours with a musical intelligence. Katie graduated with a First-class Bachelor of Music (Honours) degree from Birmingham Conservatoire in 2015 and is currently studying for her Master of Arts degree at Trinity Laban Conservatoire for Music and Dance, with Anna Pope, Wissam Boustany and Chris Green (piccolo). – to offer a free place on the course subsidized by supporters of Flutes in Tuscany, this funded place is designed to help those in full time education or on the point of launching their careers as a flautist. – to encourage and develop performing opportunities with a recital opportunity on the course and a second recital, supported by Flutes in Tuscany, in a venue of within Europe (tbc). – to work with a professional accompanist before and during the course, the pianist, Sally Halsey, will be available to rehearse with the Young Artist. There is a section in the application form to be completed and submitted by May 1st, with details of your proposed recital, with programme notes and biography, signed by a current or recent flute teacher, together with a recording of no longer than 10 minutes. The course director and tutor, Elizabeth Walker, Sarah Murphy, and course accompanist Sally Halsey, will offer the award by June 1st in the year of the course. Their decision is final. The award will be funded by sponsors. The course director will notify the recipient, who will be expected to share relevant information with the sponsors and to involve them where necessary. From our first year, Flutes in Tuscany has gratefully received financial support from the specialist flute shop, Top Wind (topwind.com). Top Wind has become the place to visit when you or your orchestra is touring Europe, or you want somewhere interesting to spend a few hours between rehearsals. Or even simply if you’re in London for the day and want to browse through the flute music and flute recordings. Top Wind address is: 2 Lower Marsh, London SE1 7RJ. 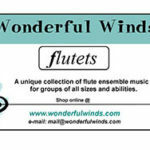 Each year, arrangements are supplied from WonderfulWinds (wonderfulwinds.com), publishers of a unique collection of wind ensemble music. Pearl Flutes is one of the sponsors for ‘Young Artist of Flutes in Tuscany’. We are grateful to our Sponsors.